Photo: Meng House (Hill House; Clough-Wallace House), ca. 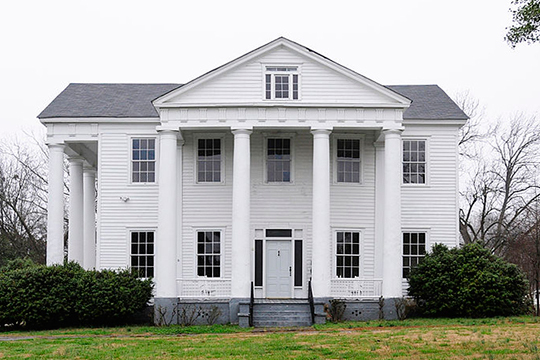 1832, 117 Academy Street, Union, SC. Listed on the National Register of Historic Places in 1976. Photographed by user:User:Bill Fitzpatrick (own work), 2012, [cc-by-3.0 (creativecommons.org/licenses/by/3.0)], via Wikimedia Commons, accessed November, 2014. The Union County Courthouse is located at 210 West Main Street, Union, SC 29379; phone: 864-429-1603. E. Thomas Sims, Survey Historian, H. Thomas Shaw, South Carolina Department of Archives and History, Historic Resources of Union, S.C. ca. 1823-1940, nomination document, 1988, National Park Service, National Register of Historic Places, Washington, D.C.